Our Aluminium Snap Frames designed for larger posters are ideal for preserving and presenting your bigger graphics. In addition to our stock large snap frames we can manufacture custom sized snap frames to almost any RAL colour. Our stock large snap frames are individually boxed, They clip open for easy poster insertion. They are supplied with fixings, which are hidden behind the snap frame when it is wall mounted. Their protective cover is UV grade anti glare PVC and their back panel is 1.5mm rigid plastic. 1,000mm x 1,400mm Black Snap Frame, 32mm. For a poster of 1000mm x 1,400mm (39.4" x 55") Our ..
1000mm x 1,400mm Matt Silver Snap Frame, 32mm. For a poster that is 1000mm x 1,400mm (39.4" x 55"..
27"x41" Silver Snap Movie Poster Frame, 25mm. For a poster that is 685mm x 1042mm, Our 27" x ..
27"x41" Black Movie Poster Snap Frame, 25mm. For a poster that is 685mm x 1042mm Our 27" x 41" B..
30"x40" Lockable and Waterproof Silver Snap Frame, 32mm. For posters of 1016mm x 762mm. Our 3..
30" x 40" Oak, Dark Wood Effect Lockable Snap Frame, 32mm. For a poster of 40 x 30 inches poster ..
30" x 40" Pine, Light Wood Effect Lockable Snap Frame, 32mm. For a poster of 40 x 30 inches poste..
30"x40" Lockable Silver Snap Frame, 32mm. For a poster that is 30"x40" (762mm x 1,016mm). Our..
30"x40" Silver Tamper Proof Poster Frame, 32mm For posters 30x40 (762mm x 1,016mm) Our 30" x..
30 x 40 Waterproof Silver Snap Frame, 35mm for a poster that is 30" x 40"Our 30" x 40" Waterproof..
30" x 40" White Aluminium Snap Frame, 32mm. For a poster of 30 x40 inches (762mm x 1,016mm). Our..
30"x 40" Lockable Blue Snap Frame, 32mm. For a poster that is 40 x 30 inches (1016mm x 762mm). ..
30"x 40" Lockable Green Snap Frame, 32mm. For a poster that is 40 x 30 inches (1016mm x 762m..
30"x 40" Lockable Red Snap Frame, 32mm. for a poster that is 40 x 30 inches (1016mm x 762mm). 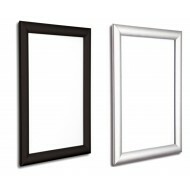 ..
30"x 40" Lockable White Snap Frame, 32mm. For a poster that is 40 x 30 inches (1016mm x 762mm). ..
30"x40" Lockable Black Snap Frame, 32mm. For a poster that is 30"x40". Our 30" x 40" Lockable..
30"x40" Black Snap Frame, 32mm.For a poster that is 30 x40 inches (762mm x 1,016mm) Our 30" x..
30"x40" Black Tamper Resistant Snap Frame, 44mm. For a poster that is 30 x 40 inches (762mmx1016m..
30"x40" Blue Snap Frame, 25mm, for a poster that is 30"x40" 762mm x 1,046mm. Our 30" x 40" Bl..
30"x40" Green Snap Frame, 25mm. For a poster that is 30"x40" 762mm x 1,046mm. Our 30" x 40" G..